It's hhhhhere! The new shipment has been unloaded, dusted and cataloged. Gleaned from Belgium, England, France and Sweden, there are many classics as well as a few surprises. 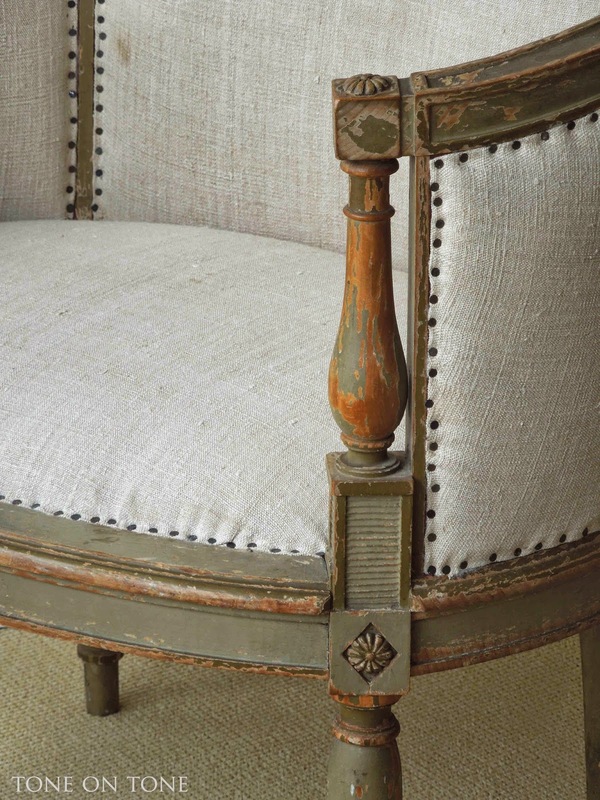 If you are thinking of updating your home for spring and summer, might I suggest an antique to add that one-off but familiar charm? 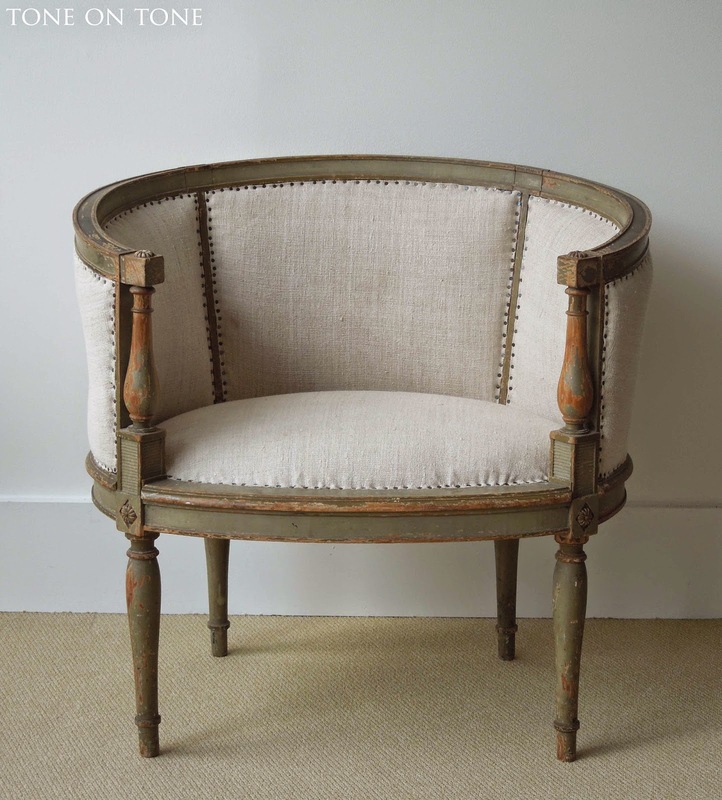 Nothing warms up a room more effortlessly and beautifully than something old, imperfect and unexpected. Here is a preview. Please come visit if you are in the area! 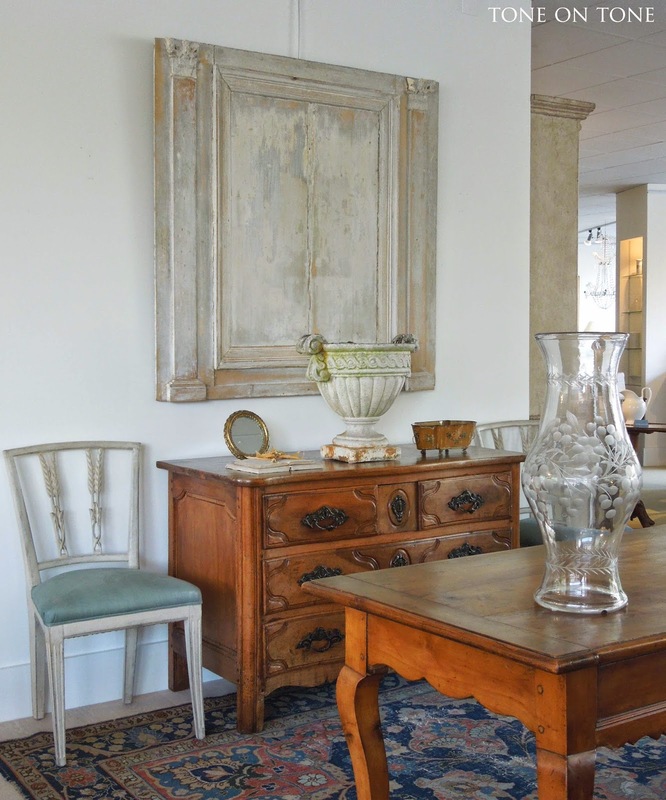 A room setting featuring a 1750s Swedish Baroque cupboard, pair (only one shown) of French painted bergeres with new blue-gray linen upholstery, French mirror with ripple frame and Swedish painted tables. 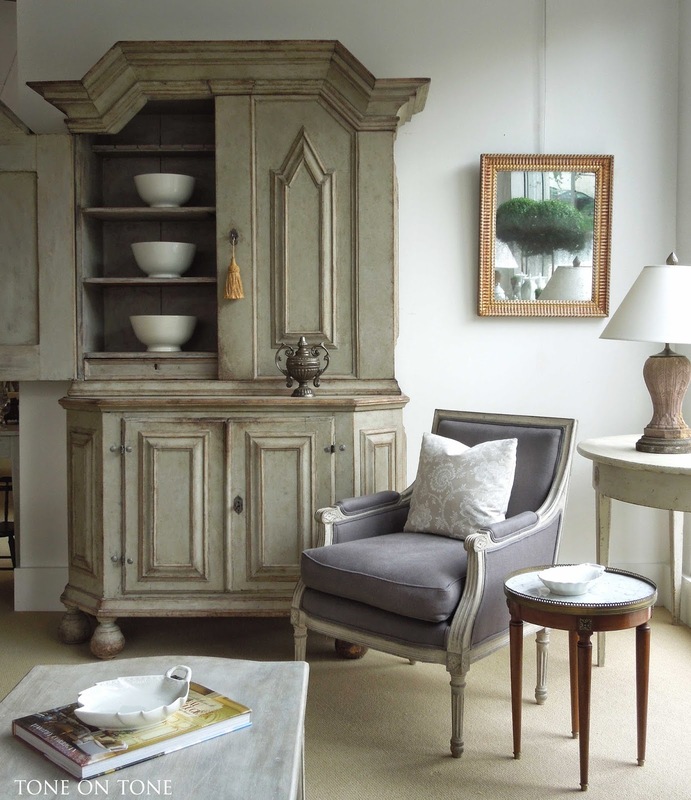 The Baroque cupboard is perfect for housing a TV - quite roomy inside. 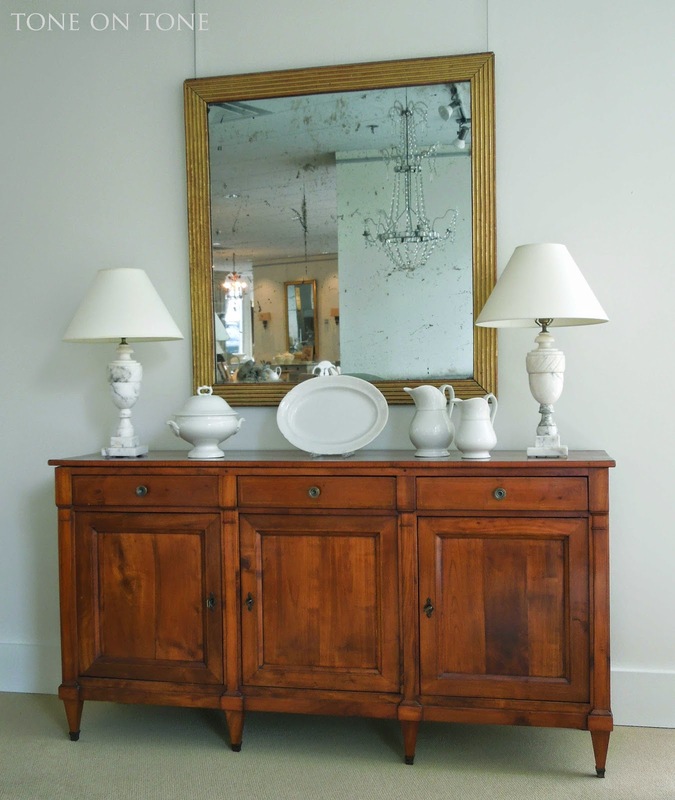 Here is a Swedish painted sideboard with gracious stepback, curved sides. 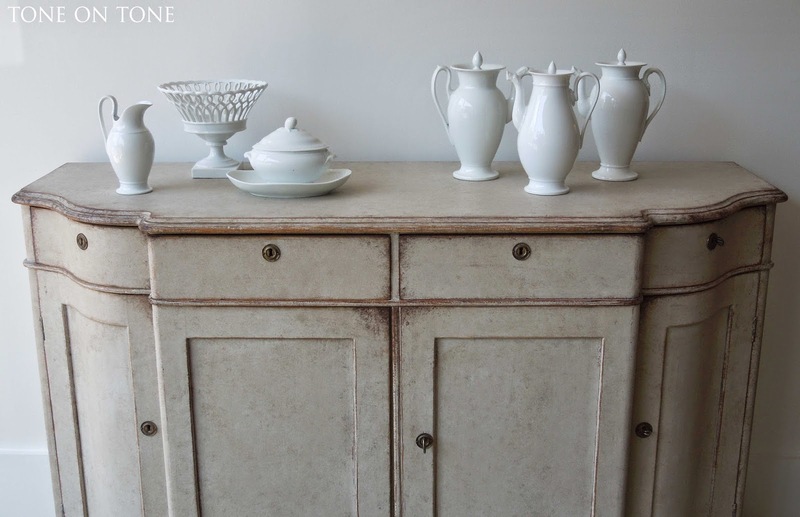 The large collection of antique white china is from Paris - come check out the rest! BTW, look at the size of my topiaries! Now is the time to repot, fertilize, spray for bugs, etc. 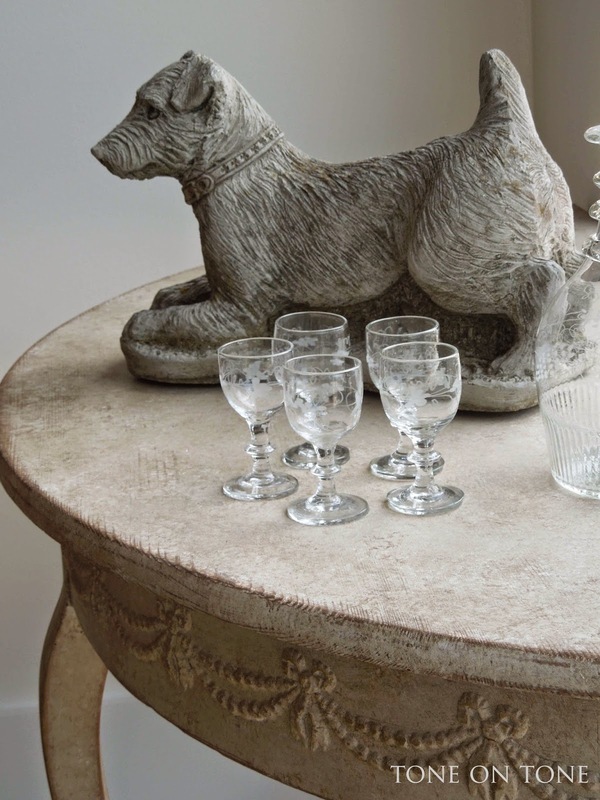 More French treasures. 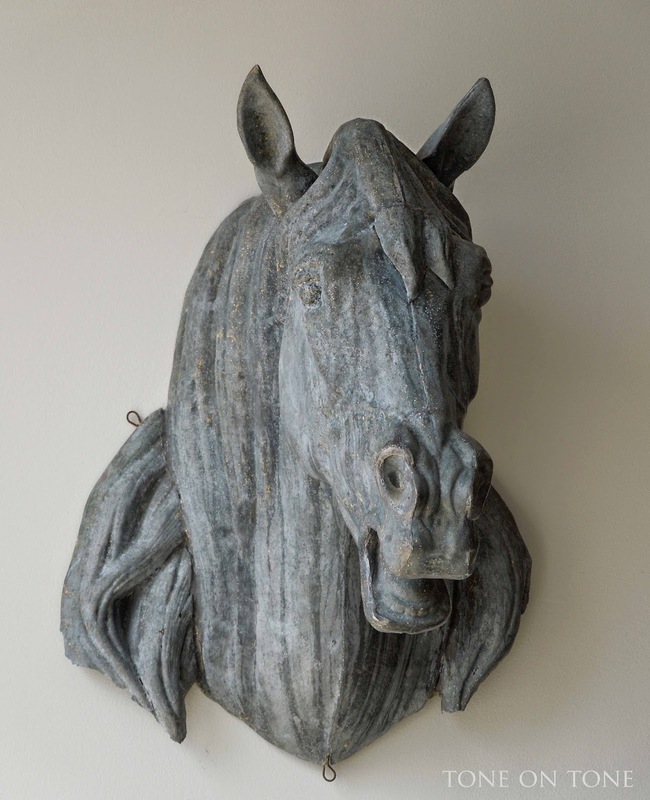 The 19th century zinc horse head, with traces of gilt, has superb patina and the best form. It's 100% genuine and intact. It would have once graced a stable or a butcher's shop as a trade sign. 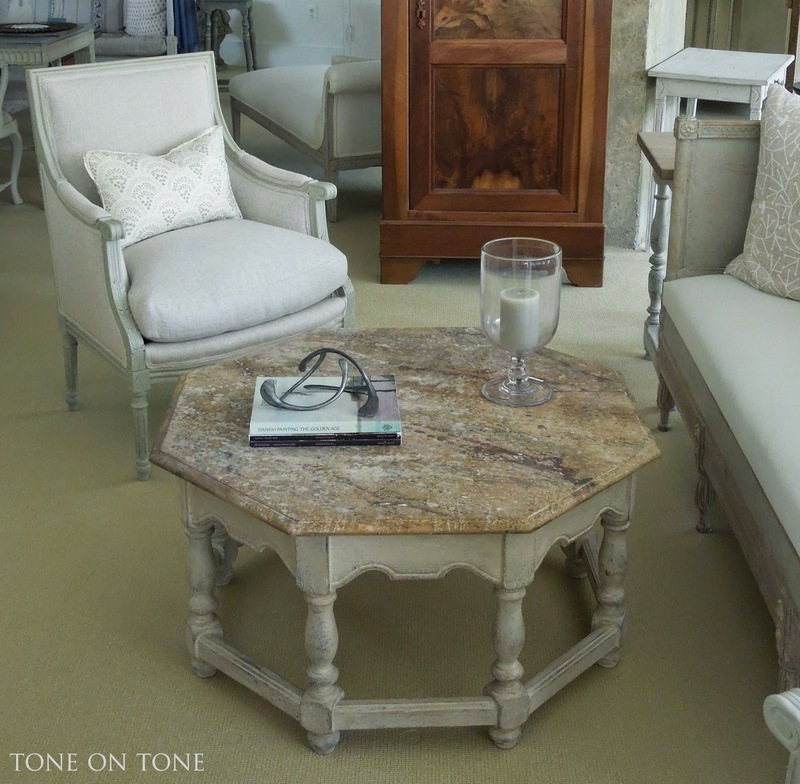 The Neoclassical open armchair and mahogany table are from the early 1900s. Here are a few of my favorites. 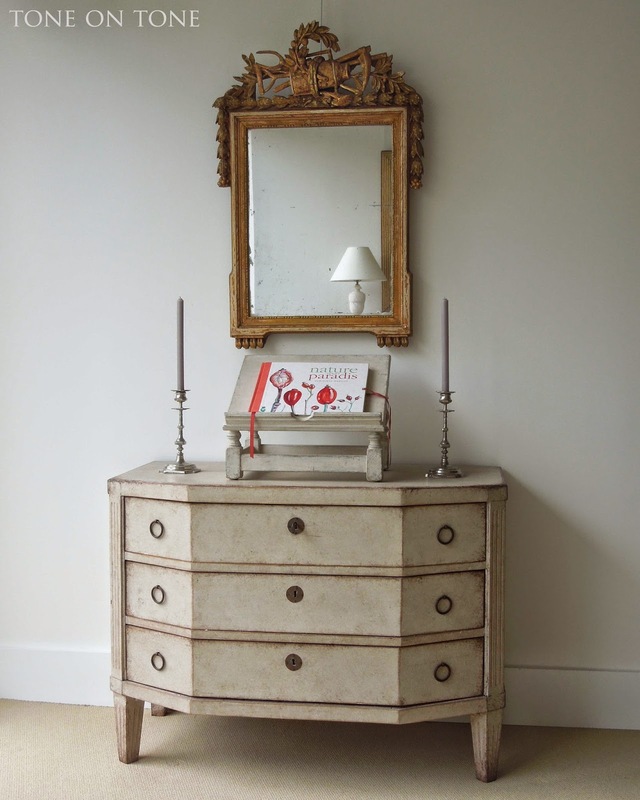 First up is this trumeau mirror with its mercury glass framed in reeded giltwood over a painted back. 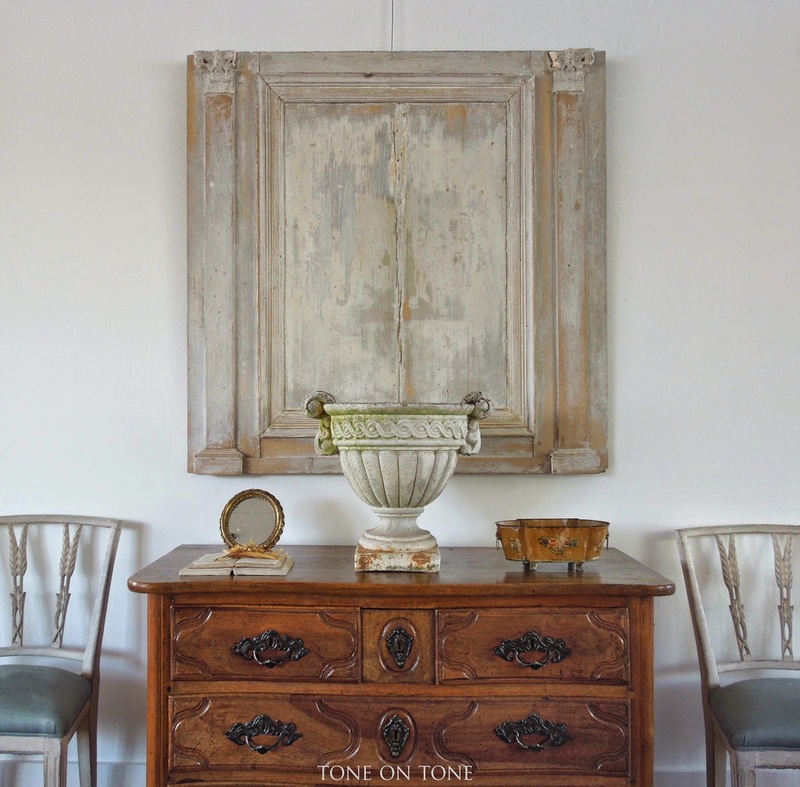 I love its textured patina juxtaposed over the walnut sideboard's rich patina. 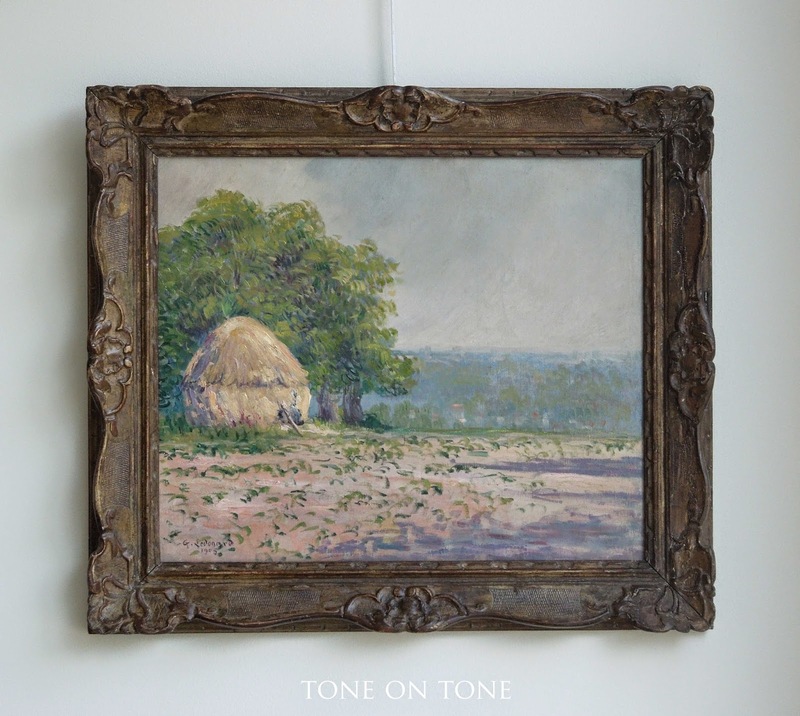 And the fine Impressionist oil on canvas doesn't look overly serious in the mirror's company. 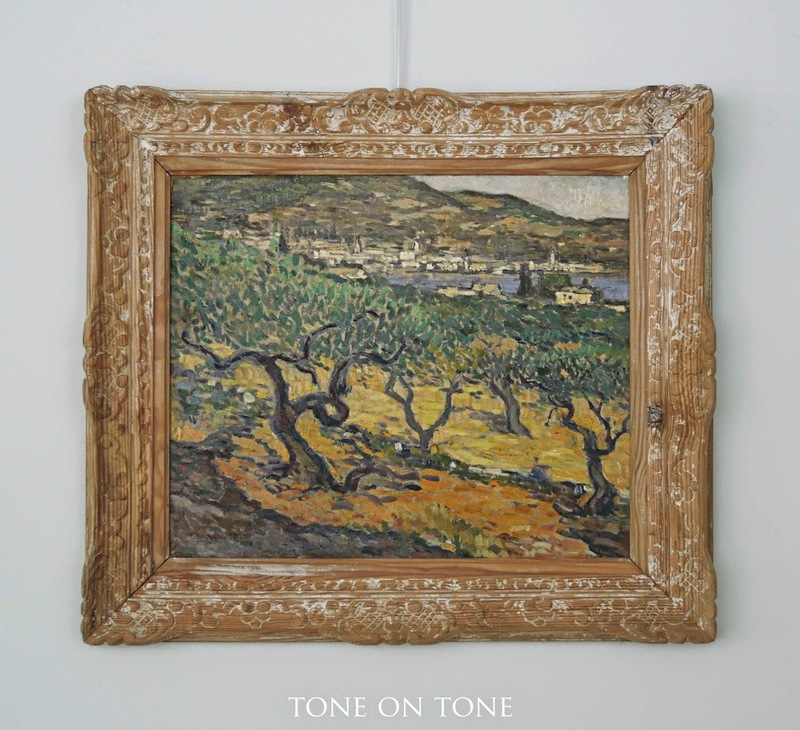 A closer look at this signed and dated important work from late Impressionism. 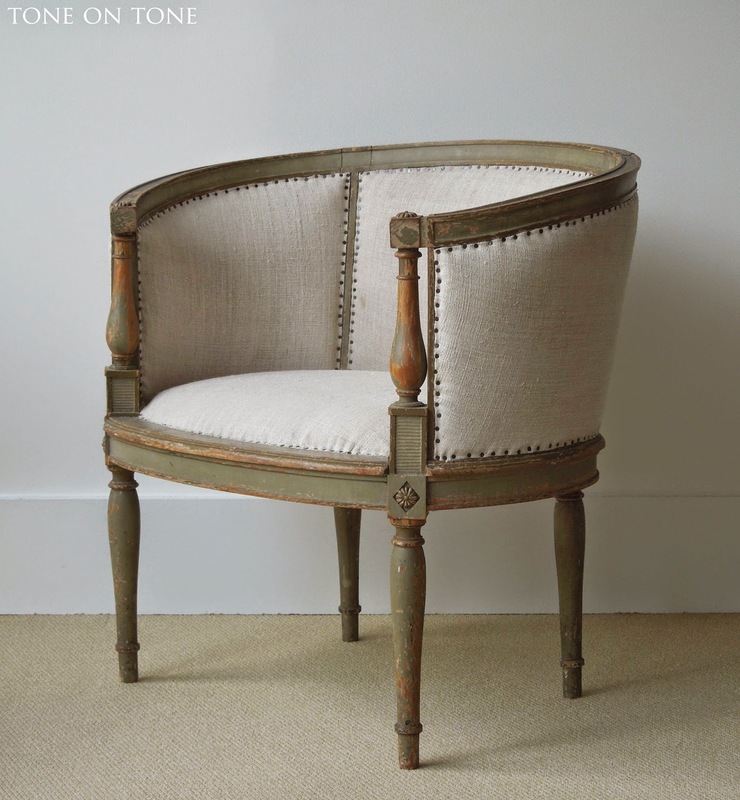 The Montparnasse carved wood frame is exquisite. Lunch is ready! 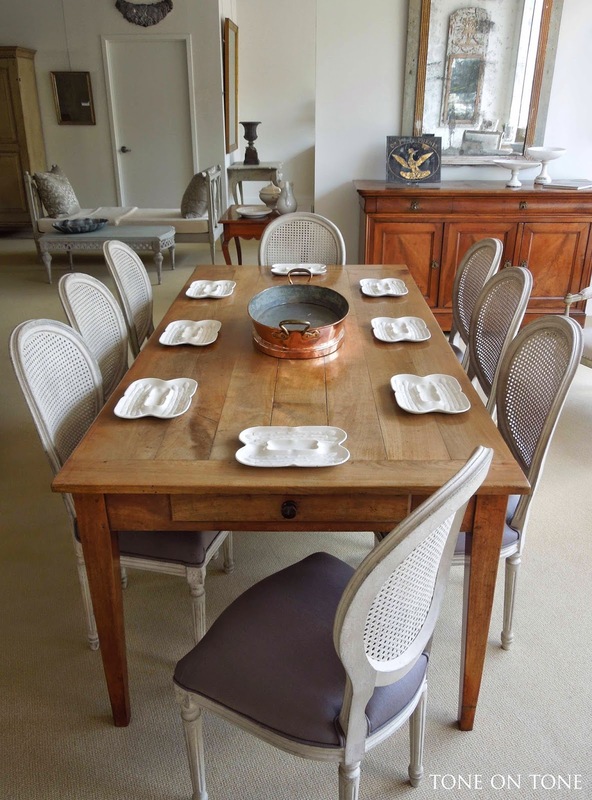 Meals served on this generous fruitwood farm table with painted caneback chairs would, I imagine, be utterly irresistible. Notice the cutlery drawer and a long extension on the other end (not shown here). 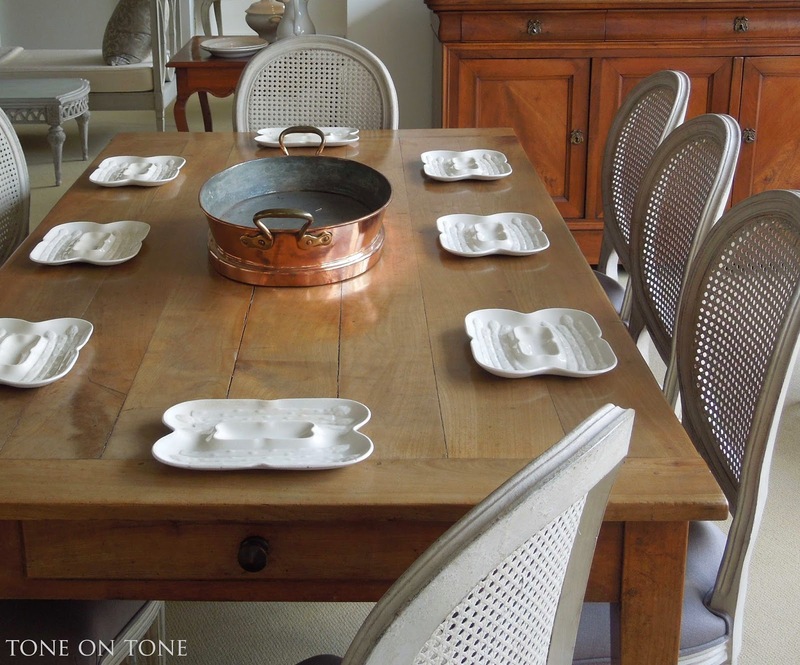 English 19th century creamware asparagus plates are by Minton. 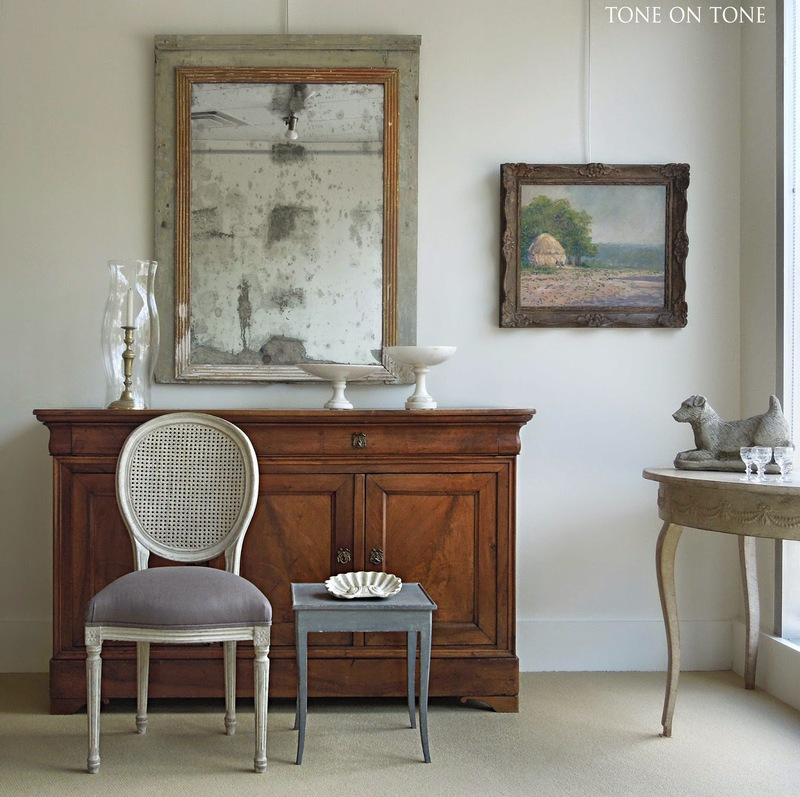 This vignette features a French 1770-90s trumeau mirror, early 1900s large sunburst mirror and late 1890s Directoire style armchairs (one shown here). 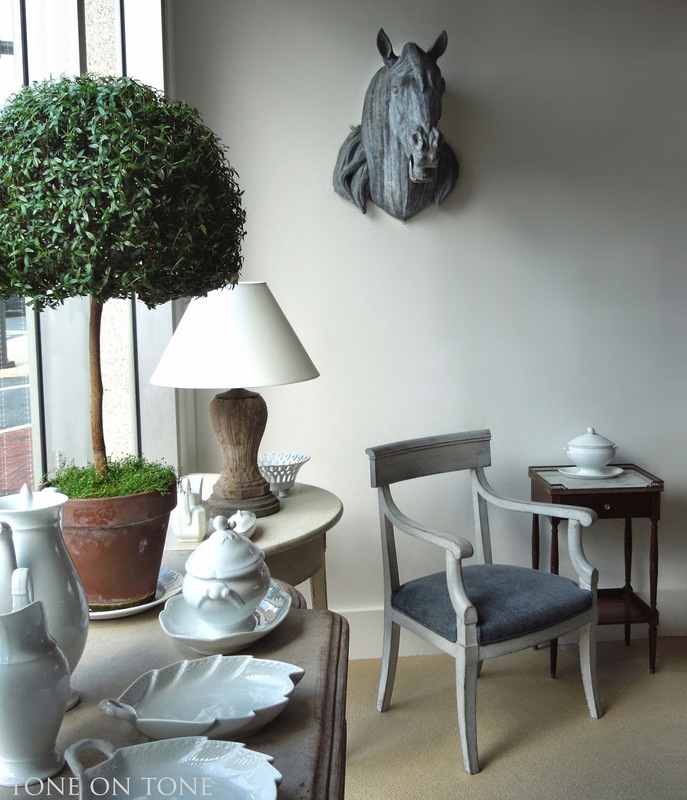 The buffet is Swedish from the last quarter of the 1700s. What's on top of the Swedish buffet? A hedgehog taking a bath, of course! 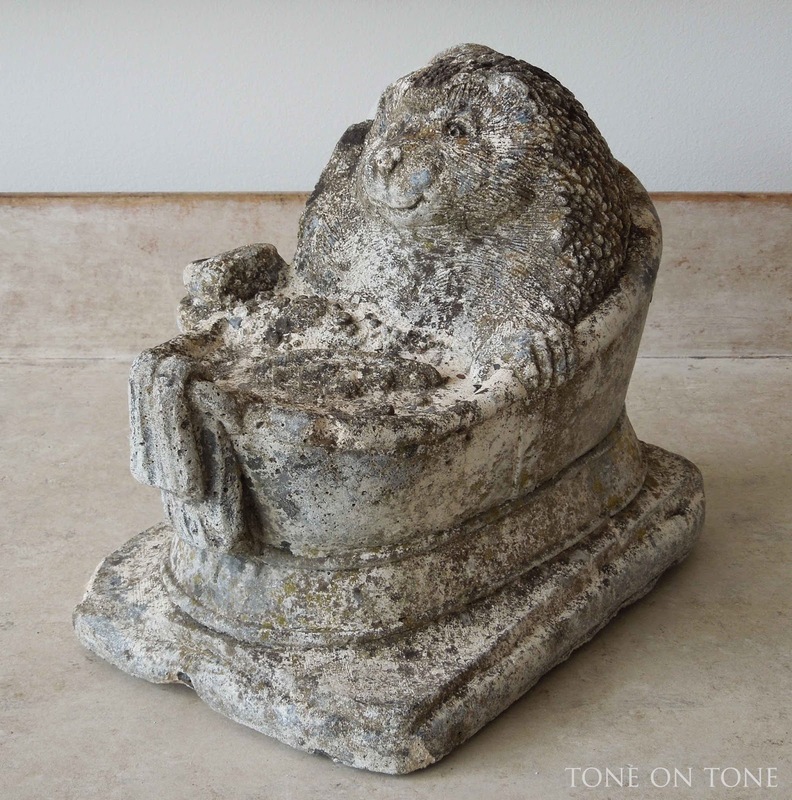 Clearly, he's not doing such a fine job from the look of all that moss and lichen. Good thing because I love him just like that. BELOW: A Jack Russell Terrier garden companion. Both the hedgehog and Jack Russell are English from the 20th century. 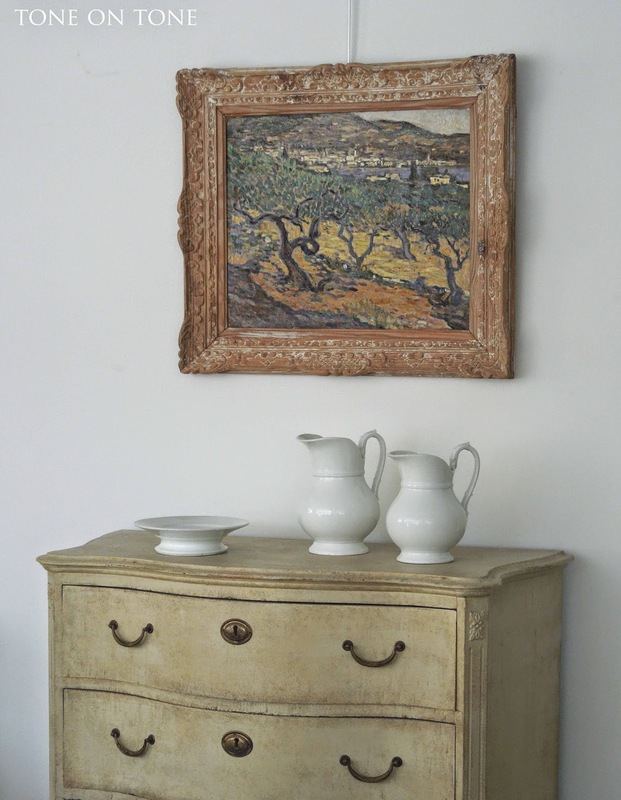 Such a classic Provencal painting with its sun drenched hues and rich texture. Again, this one is dated and signed by a listed artist. The pine Montparnasse frame is a marriage, but boldly paired. 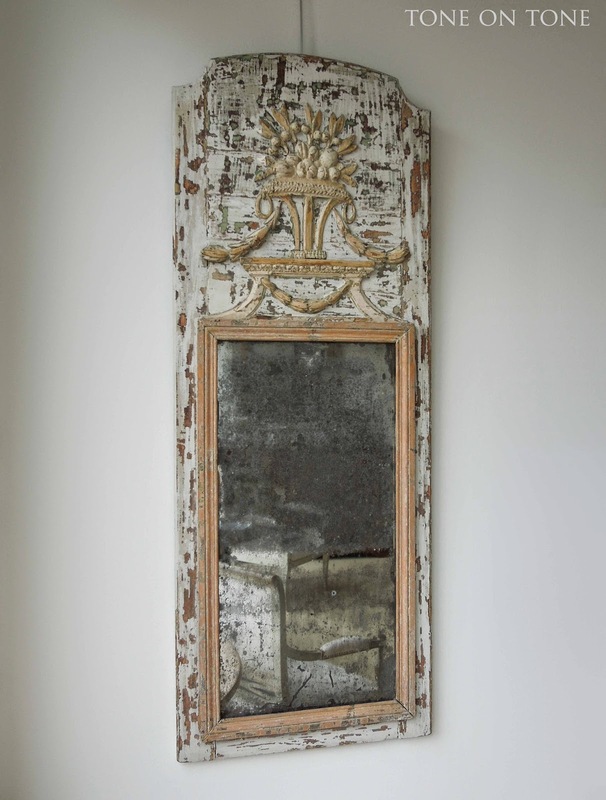 A Louis XVI (Ca 1770-90s) mirror, crested with garden accoutrements, hangs over an antique Swedish painted chest with modern spirit. Notice the chest's strong angles and crisp lines. 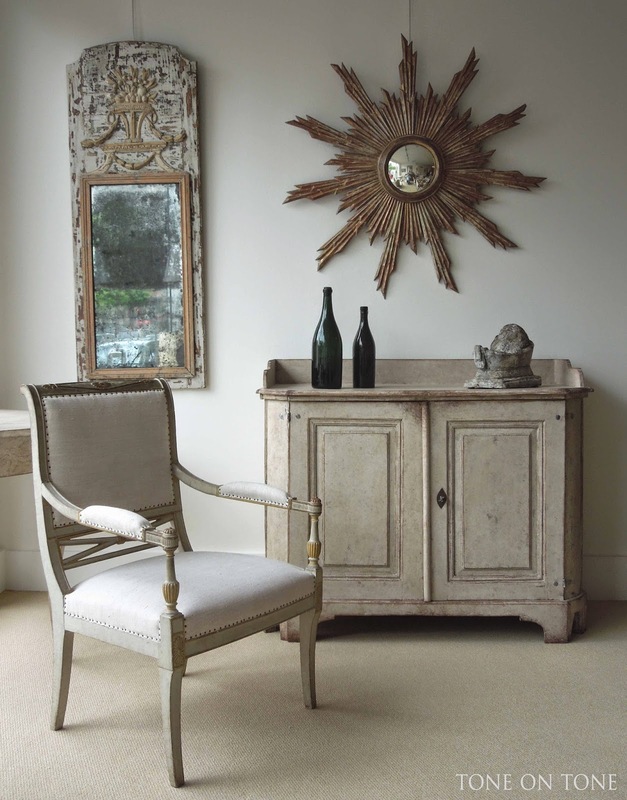 The early painted boiserie panel and serpentine chest are both French, and they are flanked by English side chairs. 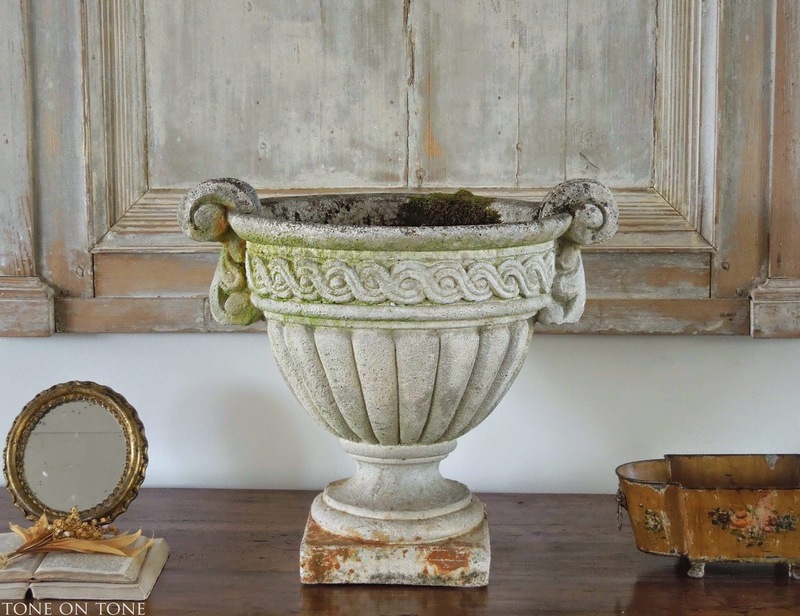 A 20th century composition footed urn with semi-lobed bowl and guilloche frieze. 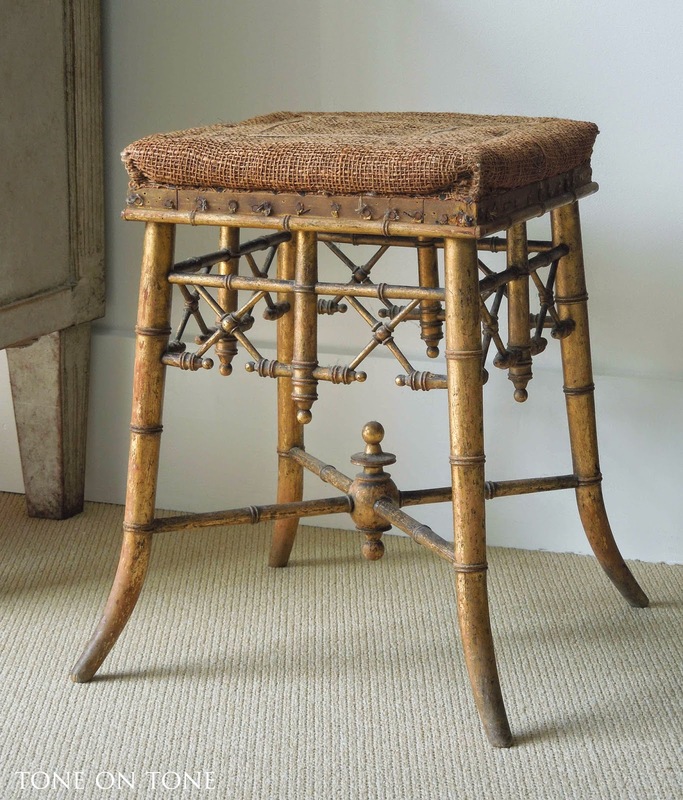 This Napoleon III Chinoiserie gilded faux bamboo stool has that coveted, faded elegance. 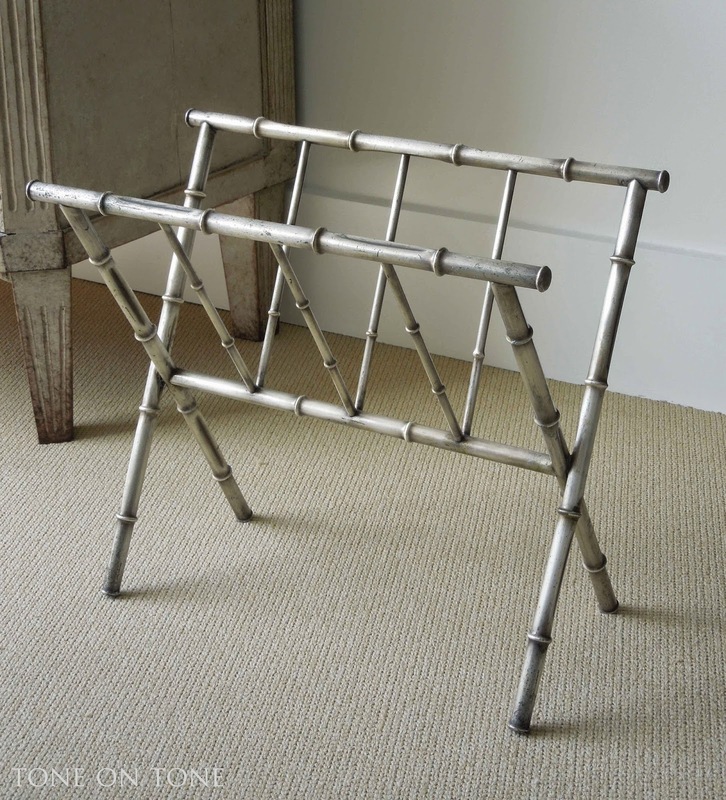 Two more faux bamboo pieces, but from the 20th century. 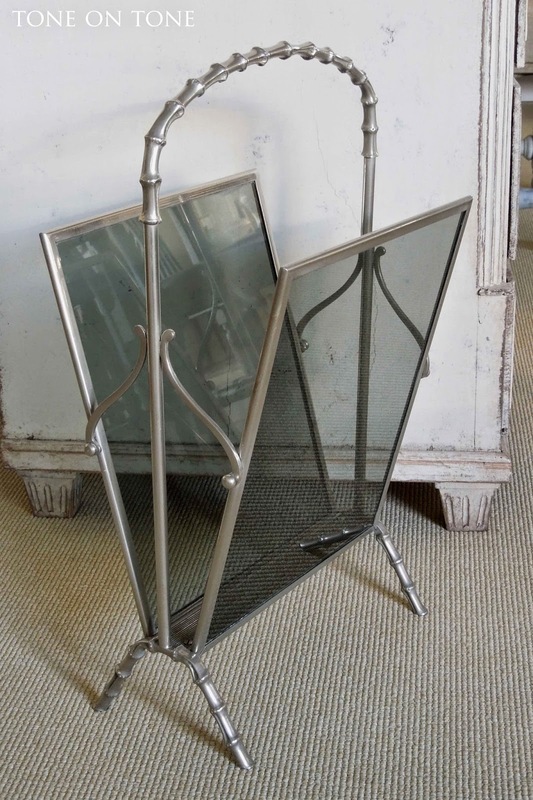 TOP: A very fine Maison Bagues nickel over bronze or steel magazine caddy with smoked glass panes. BELOW: A chic aluminum version. 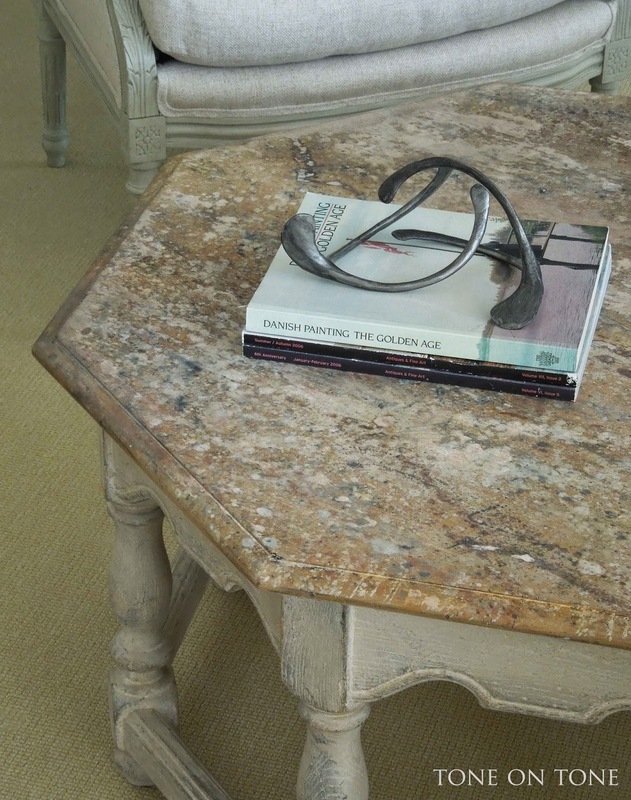 Something a bit different for the shop: A fabulous Moroccan style octagonal coffee table with trompe l'oeil marble painted top. 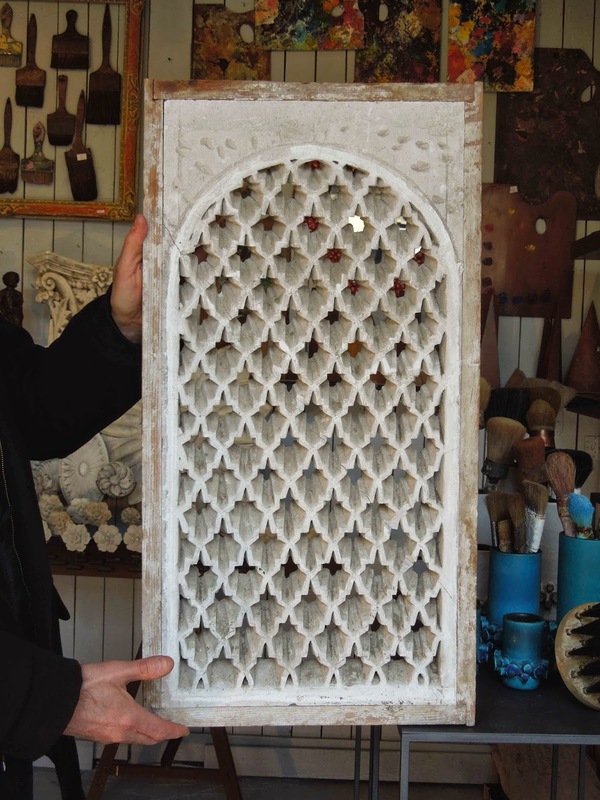 Speaking of Morocco, I absolutely love this Mashrabiya chalky plaster window from a riyad. 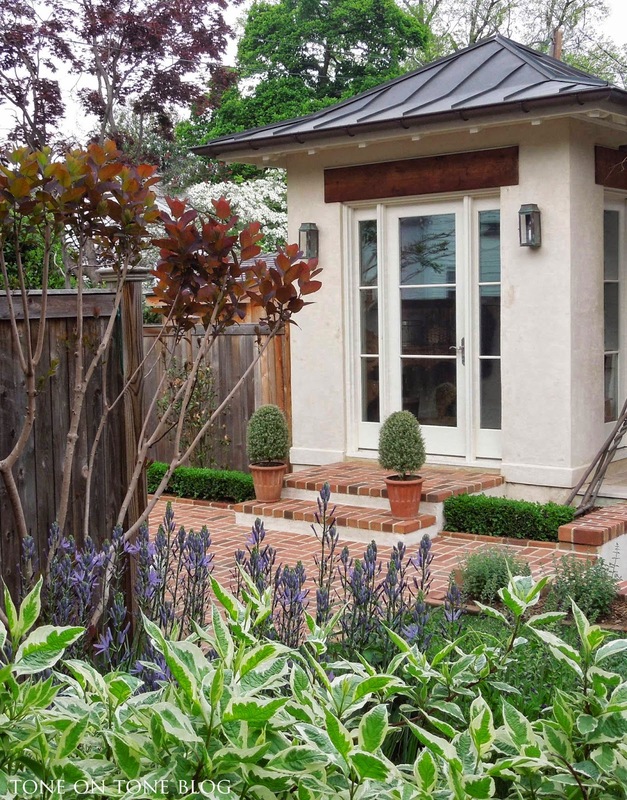 It was designed for the homeowners, especially ladies, to see and hear the outside world while protecting their privacy. 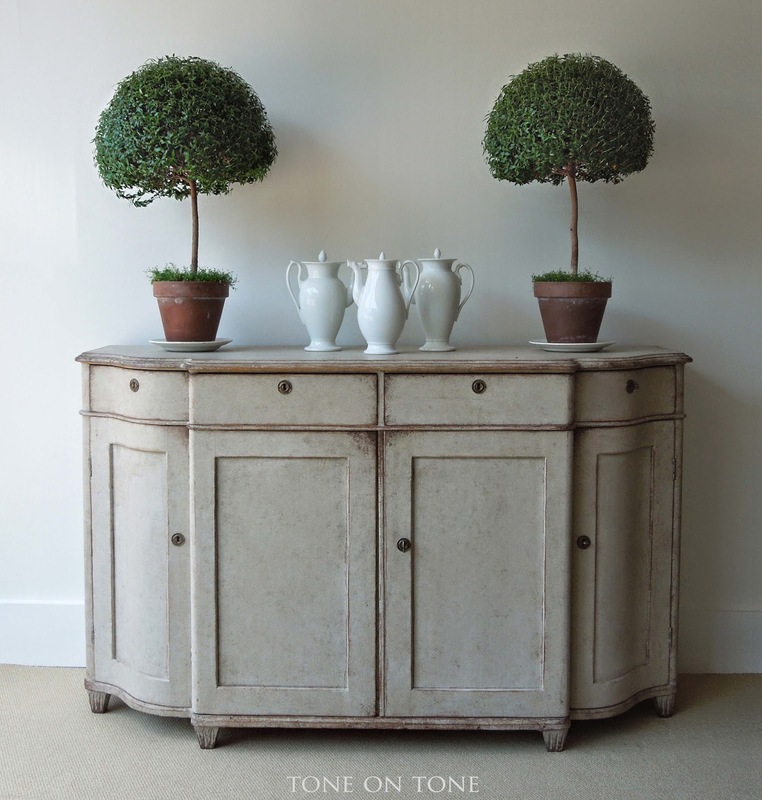 Last we have a French Directoire style fruitwood enfilade with subtle boxwood stringing. 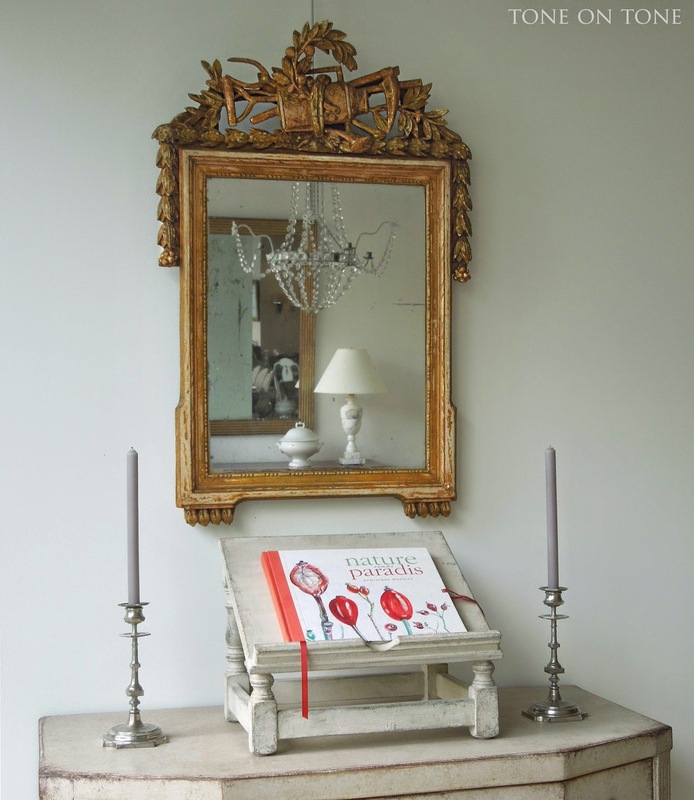 The gilded mirror with reeded frame and mercury glass is also French. And if we don't chat again, have a wonderful and safe Memorial weekend. Let us all remember and honor those who have given their lives in service to our country. One of my favorite morning rituals is to take the dogs for long, leisurely walks. It's a friendly way to catch up with neighbors, as well as find out what's new and exciting. 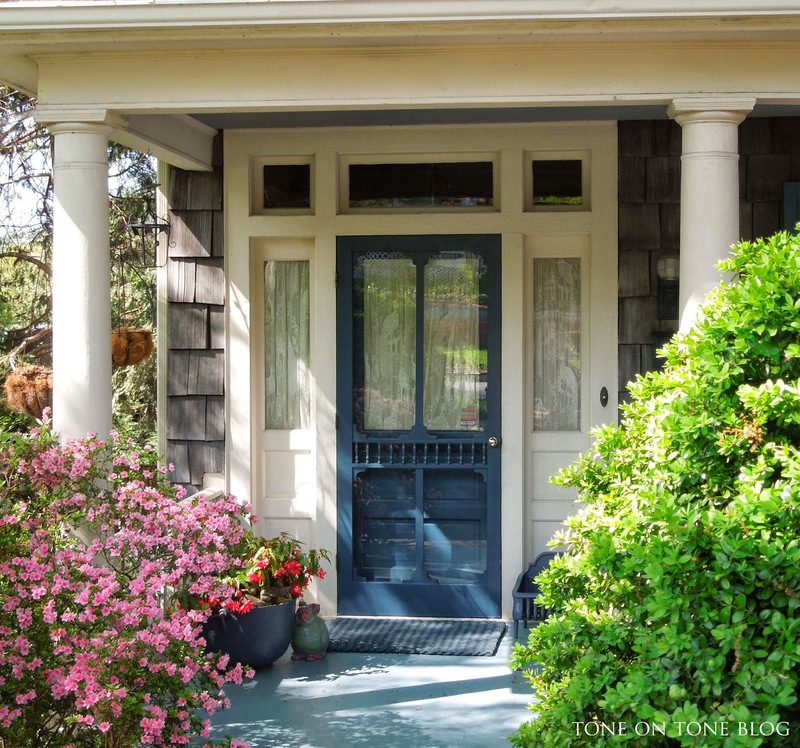 It's also a wonderful opportunity to study the neighborhood decor - see what paint colors work with, say, a brick construction or white clapboard. 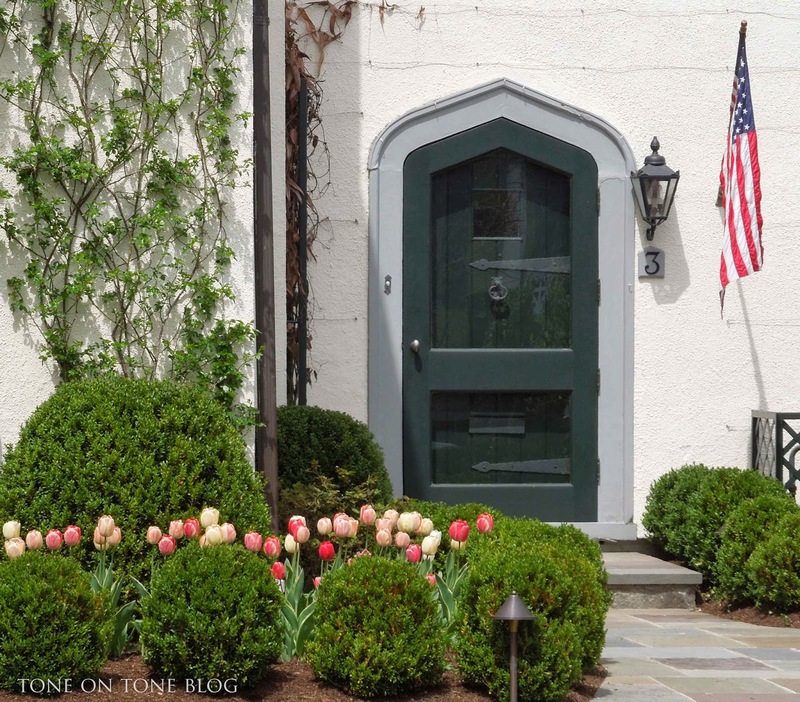 Recently, I've been thinking of adding a storm door to the back entrance of our home. Ideally the glass panels could be replaced with screens during warmer months - think energy conservation during winter and breezes without bugs from spring to fall. So with camera in hand, I've been snapping away these past few weeks. 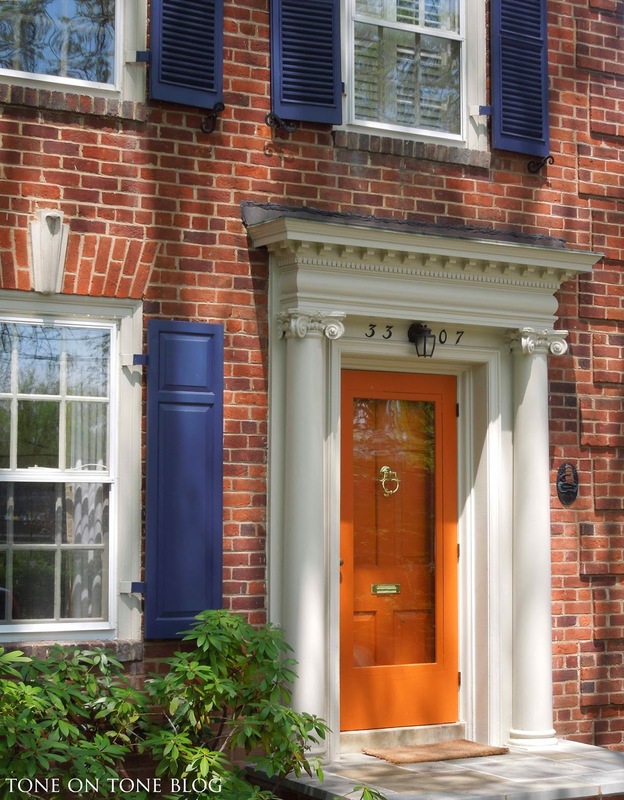 The storm doors that grace these homes (many historic) are not only attractive, but thoughtfully appointed. 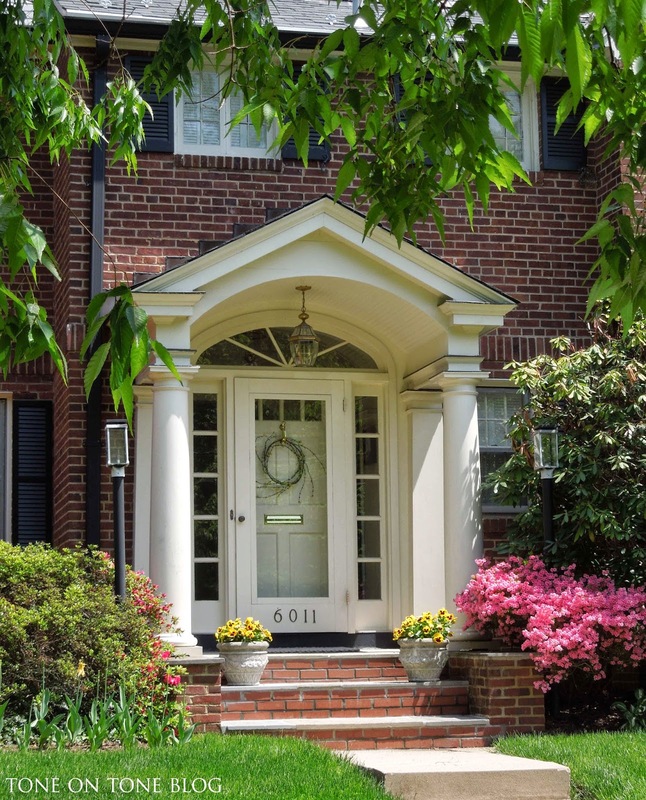 First up is this handsome stucco home with a custom storm door. 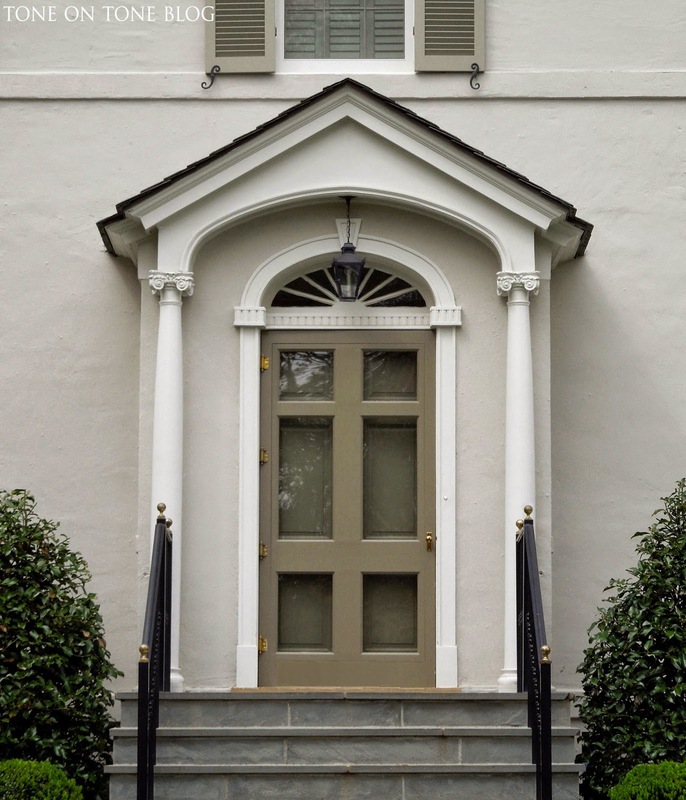 Notice how its six-panel design mimics the paneled door behind. 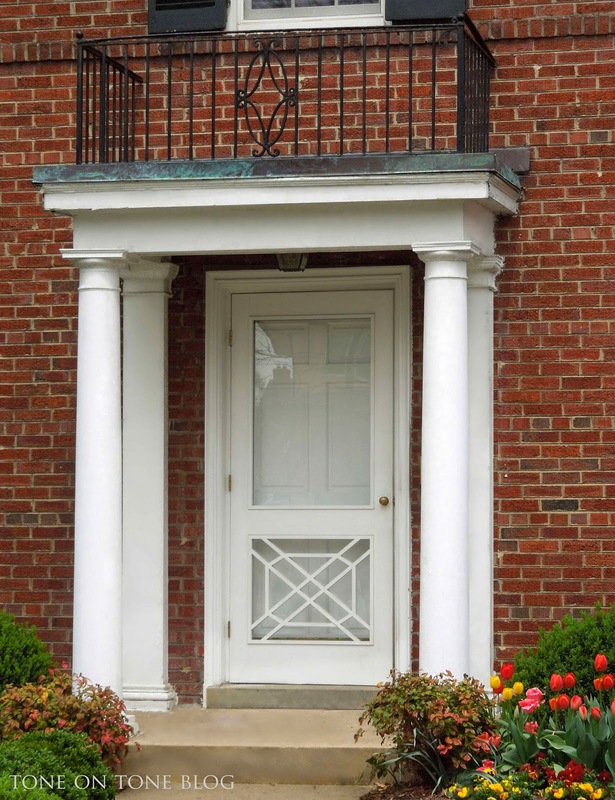 Even the sizes of the rails and stiles are the same on both doors. 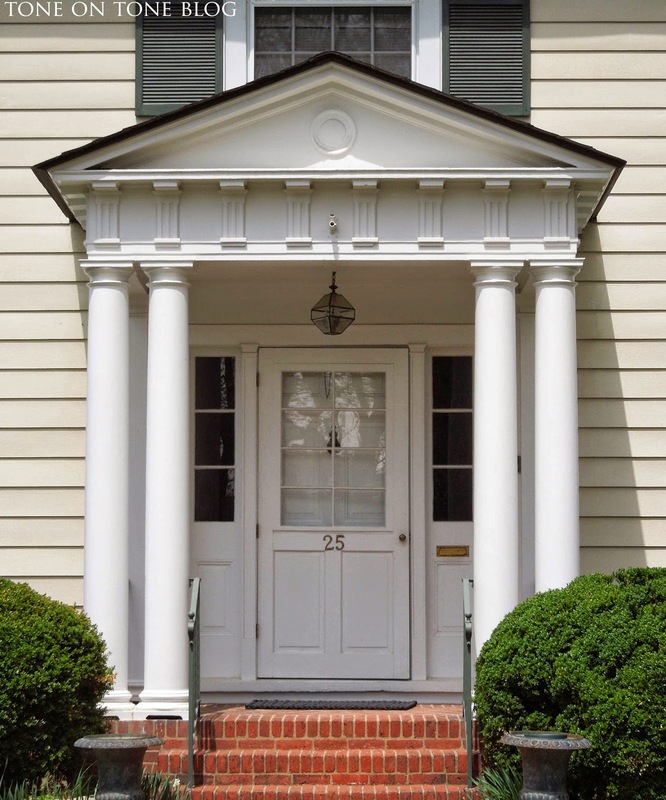 ABOVE: The grand portico with pediment over substantial columns gives this traditional brick colonial a stately presence. I really like the unified cream color scheme and storm's simple design which doesn't compete with the sidelights, fanlight, etc. 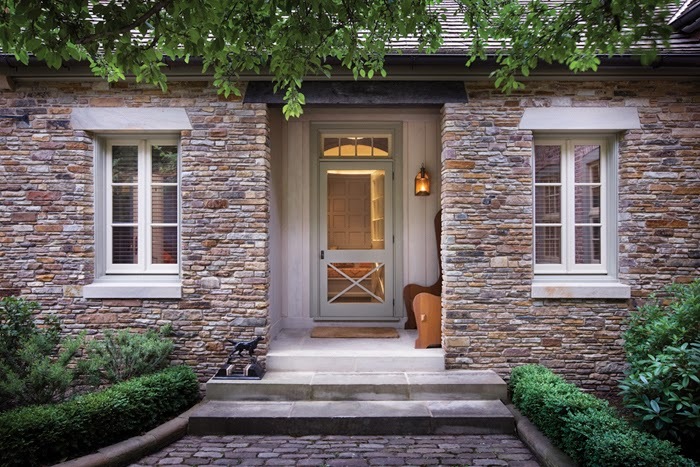 On this lovely stone and clapboard cottage, there is a similar but more intimate portico. 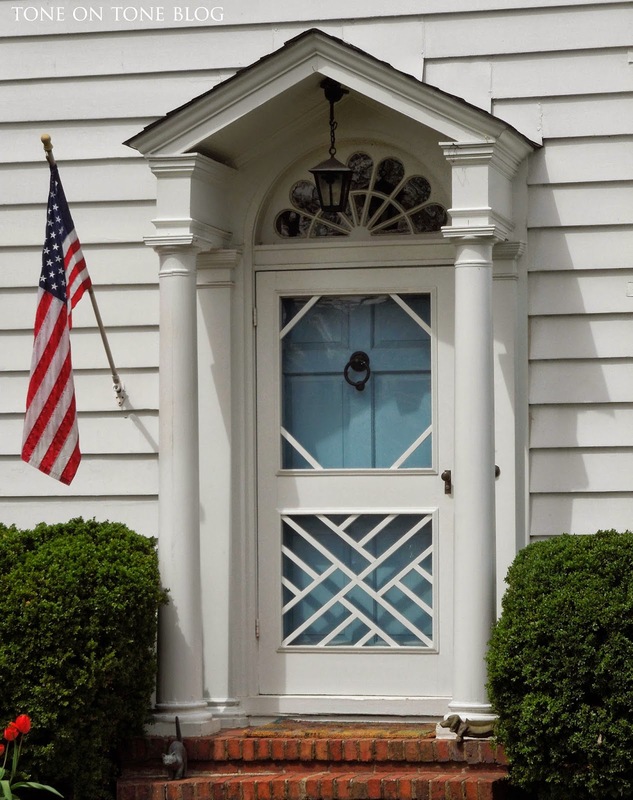 The above photo shows the actual screen door. Through the magic of Photoshop, I beefed up the central rails and stiles, and moved them to align with the sidelights - see below. I think it looks cleaner and more cohesive with the overall architecture. 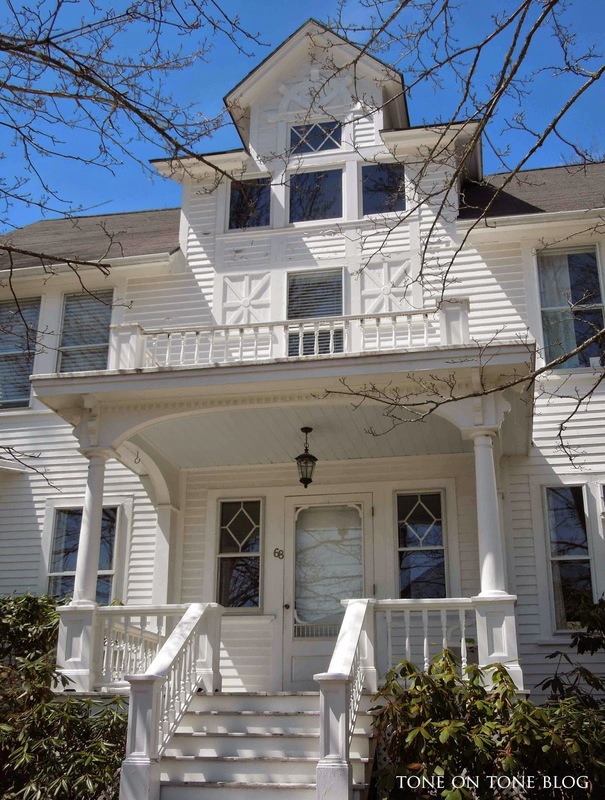 ABOVE: An early Federal in Castine, Maine. 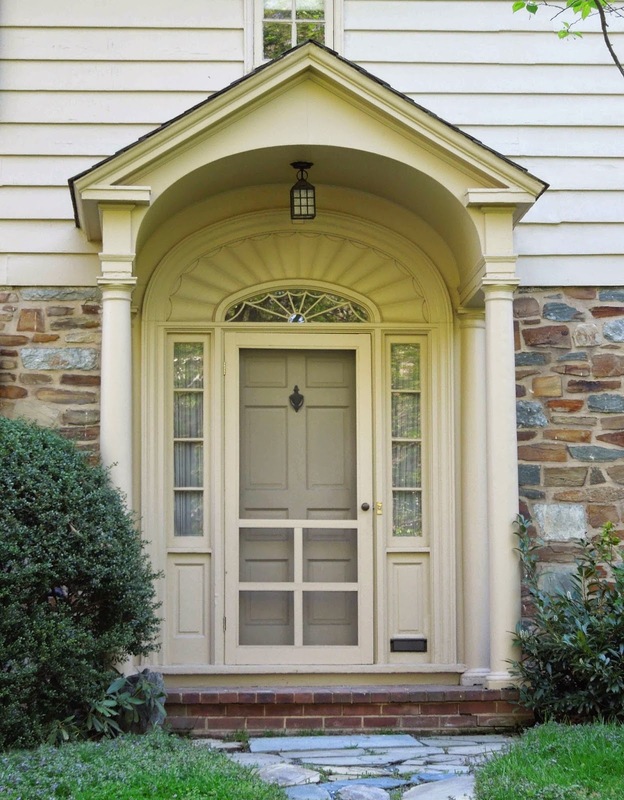 It has a similar 8-panel door with the same storm design as the previous home. 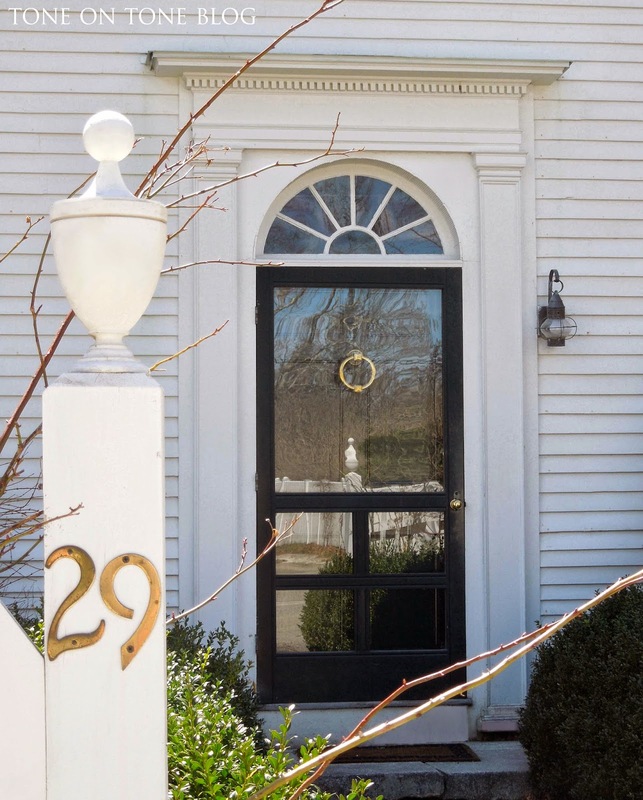 A historic white clapboard with a beautiful Chinese Chippendale storm door. If mine, the upper glass pane would be replaced with a screen during the summer months. I'd keep the bottom part glass because I know my dogs would puncture a screen as soon as they saw a squirrel. Here is another Chinese Chippendale design. Definitely not white here! 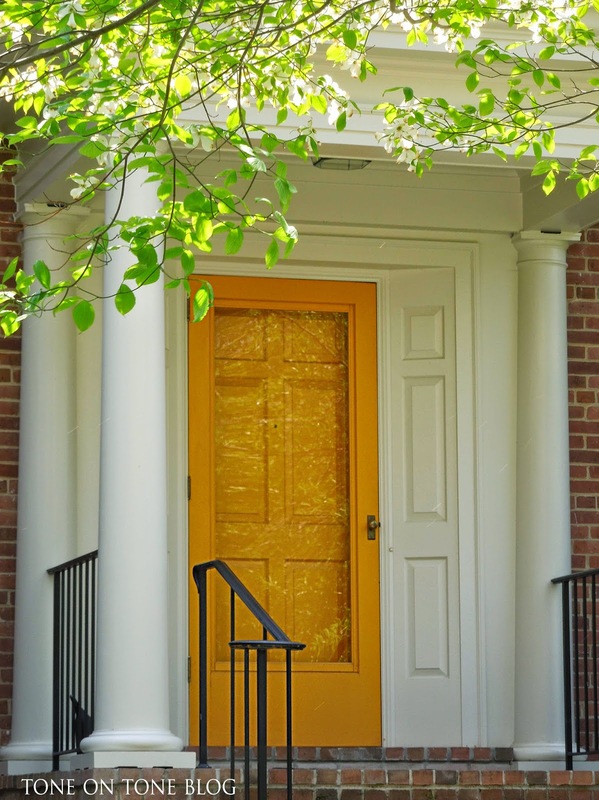 I actually think the marigold yellow is quite striking, cheerful and unforgettable. 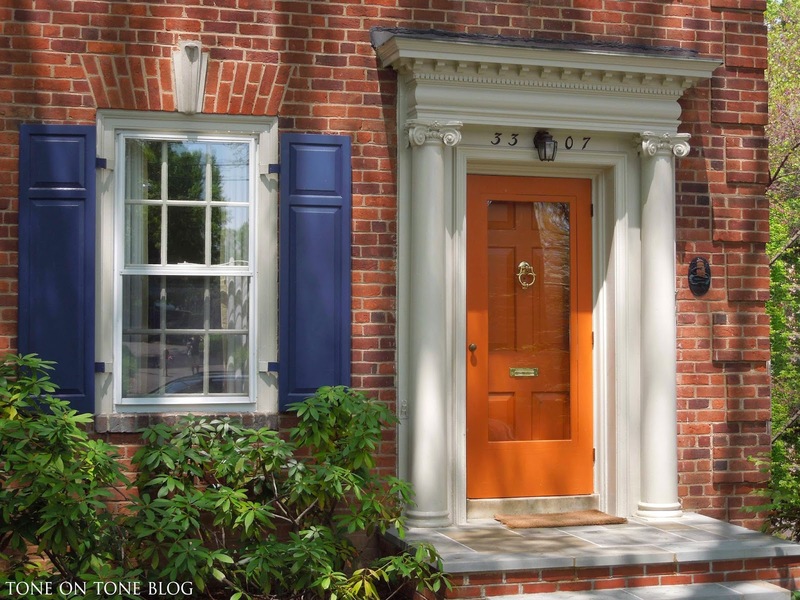 Look at this confident combination of deep blue, tan and orange on this brick beauty! GORGEOUS!! (Hey, I like color, too.) 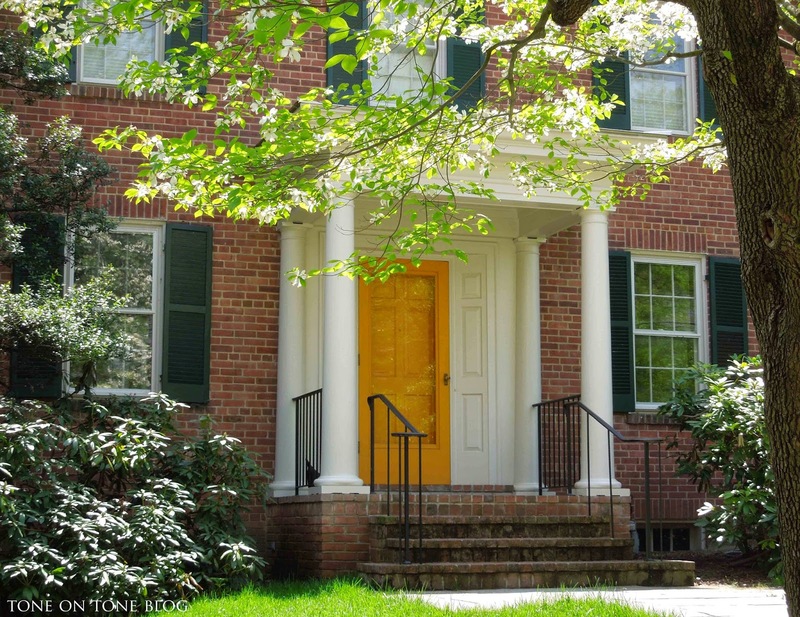 I bet the inside decor is stunning. Here are a couple of charming Victorian storms with spindles. 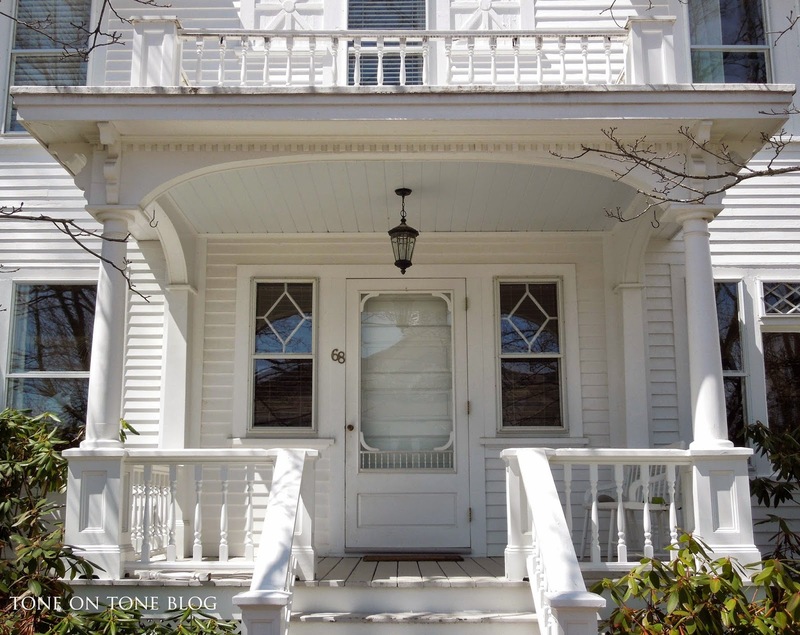 This historic gem is located in Castine, Maine. Looks like Queen Anne architecture to me - anyone know? 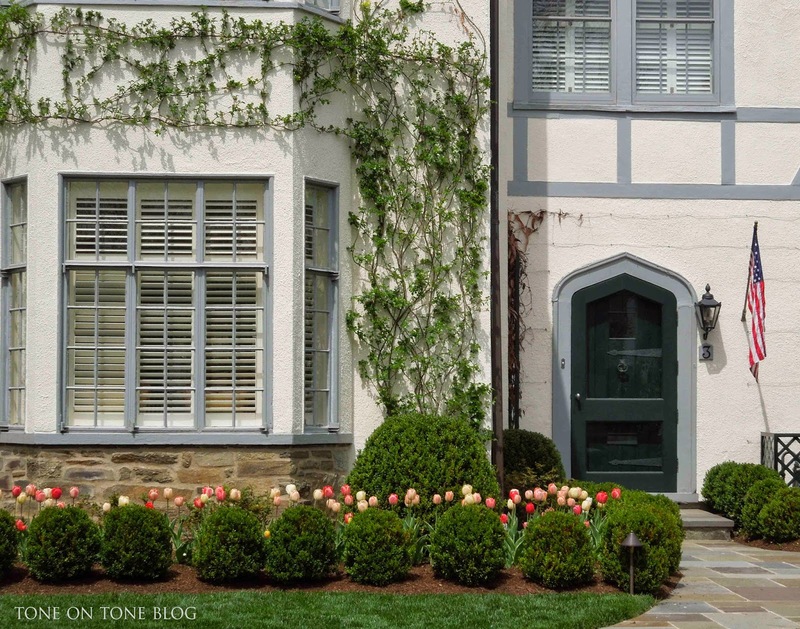 A grand Tudor with bespoke arched doors. 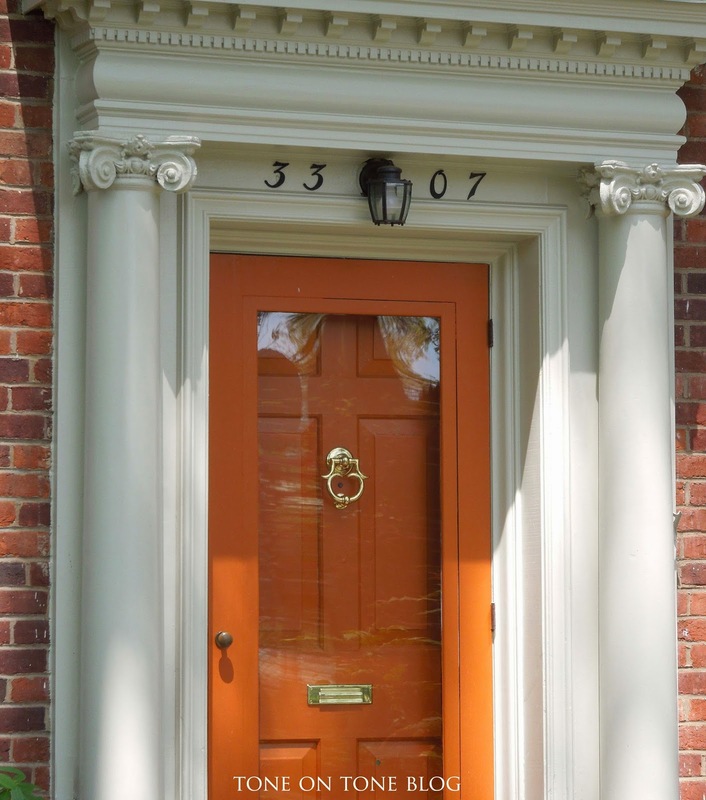 I love the house number mounted on a back plate that is also arched. 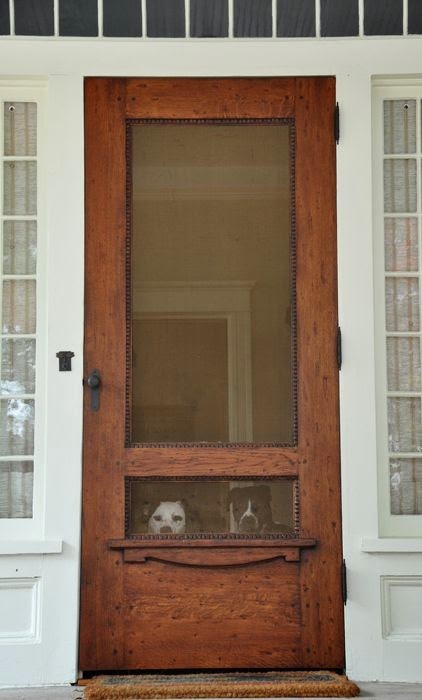 Two wonderful doors from my PINTEREST boards.